As avid fitness enthusiasts we have been carefully watching as vibration machines began to rise in popularity. We decided to put them to the test ourselves and to see, in fact, whether they performed as promised. We monitored our muscle mass and weight loss along with our overall sense of well-being. During the testing we were pleasantly surprised to see that the vibration platforms did provide incredible results and we also discovered the best vibration machine overall. We have put together our findings in the vibration machine reviews below so that you too can experience the results you are looking for. Take a look through the reviews to find the best machine that fits into your fitness and weight loss goals while also fitting into your budget. This is considered by us the best vibration machine on the market! 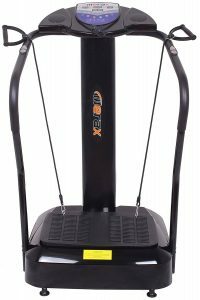 The overall best vibration machine after intense product testing turned out to be the Merax Full Body Crazy Fit Vibration Platform. It comes with a number of great features but we were really drawn to its forceful massage vibration and wide range of speeds. This model offered a more powerful vibration than the others and we really appreciated the speed range. We were able to start off slowly and then crank up the speed according to our bodies’ requirements. We also love the 10 preset programs and found ourselves using them all at different times. The Merax uses a combination of different vibrations including plinar, oscillating and linear, which uses all of the energy in your muscles. Many models only feature one type of movement, which can limit your progress. Overall, this machine’s operation was similar to the units you can find at a gym, which was exactly what we were looking for. When we were on the hunt for the best vibration machine we also wanted to find one that offered the best value for the money. We found it with the Slim Full Body Vibration Machine by Confidence. This unit outperformed the others in its price range and when you consider the quality/price ratio, this one came out the winner. It has all the bells and whistles you need to get the most out of a vibration workout. 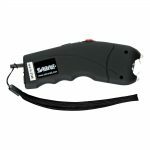 This is a lightweight vibration machine in comparison to the other models on the market. It only weighs about 70 pounds and can easily be rolled from one room to the next. When you tilt the machine up the wheels roll on the back and many users, even elderly and handicapped users, have commented that they were easily able to move the machine. This allows you to store the vibration machine in a closet or out of sight and then take it out only when you’re ready to use it. For many, this was a key feature that guided them towards making a purchase. Another top pick for the best vibration machines goes to Gadget Fit Power Vibration Plate. If you’re operating on a budget, you’ll appreciate the price point on this model. You be able to feel your muscles contracting and then relaxing as you enjoy the benefits of the workout. The rapid vibrations from the machine will get your heart pumping and your blood racing while at the same time making you feel extremely relaxed. The Gadget Fit comes with 3 built-in programs and a variety of speed settings. You only need to use this vibration platform for 10 minutes a day to see optimum results. 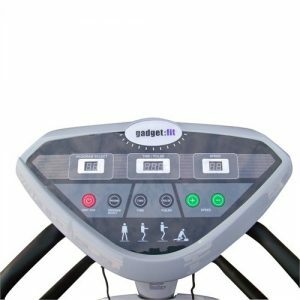 In fact, a 10 minute workout on the Gadget Fit machine provides the same results that you would expect to achieve from a 60 minute traditional exercise workout. If you’re low on funds, you can still enjoy the benefits of a vibration machine without having to break the bank. Almost any fitness center across the country has a vibration machine as part of its overall training equipment. When you use one of these machines it can increase your training results while offering a number of other important benefits. Vibration platforms can help you lose weight, increase your muscle mass, increase your circulation, reduce cellulite, increase your bone density plus much more. A whole body vibration machine can also enhance flexibility and balance. When your muscles experience the rhythmic contractions provided by these machines, it encourages increase blood circulation. It also helps to enlarge capillaries during training. As a result you’ll feel and look great and many users even notice a difference in their skin tones. As you start seeing the cellulite reducing and your body shape changing, you’ll be even more motivated to continue with your vibration training. This is indeed body shaping without surgery or liposuction. Osteoporosis is also become a worry for many people that are aging. As you get older it’s harder to do high impact workouts and this is where vibration machines step up to the plate. Many older people are choosing this workout technique because it is a low impact exercise that produces results. Vibration platforms are perfect for both young and old. Whether you are already following an active fitness routine and just want to enhance it or are looking for a low impact workout to use as your primary form of exercise, vibration machines are the answer. A vibration machine doesn’t need a lot of features to make it great, but it does require an important few. A vibration platform should be able to stand up to a lot of wear and tear so it must be constructed properly. The units that we list below are durable models that can stand the test of time. As well, there should be a range of speeds so that you can progress gradually when you feel that you are ready to handle more. You should never invest in a vibration machine that only offers a few speeds. We also found during our testing that we really appreciated the built-in programs that came with the various machines. It meant that we could simply step on the platform, push a button and then enjoy the workout. We could choose a different program on any given day to see maximum results. You’ll probably find as well that you’ll use these programs consistently so look for them in the next vibration machine you purchase. A great machine for you will fit into your budget perfectly. You won’t want to feel any guilt about the money spent for the model so base your considerations on functionality, features and your budget. This way, you’ll be able to get the most out of your machine and enjoy it for all it’s worth. Put away the other fitness equipment you own that requires a lot of time and energy. You won’t need it any longer when you invest in the Crazy Fit Vibration Platform Machine by Merax. You can increase your strength and tone your muscles without getting exhausted when you use vibration training. It only takes 10 minutes to receive a workout on your whole body and as a result you can improve your blood circulation, lose weight, strengthen your bones, reduce stress, increase your muscle mass and improve your balance. All of this can be done from the comfort of home without having to pay for expensive gym memberships. 10 preset programs – Many other vibration machines only offer one program but with the Crazy Fit Vibration Machine you’ll have 10 different preset programs to choose from. Fitness experts suggest using different programs from one day to the next so that your body thinks it is doing different exercises. You’ll get much more out of a machine that offers a variety of programs. Can change the range of speed – This is an important feature to look for in any vibration machine. You’ll want to start out slowly and then increase the speed as you build up tolerance. Just like regular exercise routines, you’ll need to pace yourself to avoid injury and muscle pain. Comes with yoga straps – Yoga straps allow you to exercise your arms and upper body. You can use them to help maintain the best position for your upper body workout. Reduces cellulite – If you’ve been trying to reduce cellulite using traditional exercises and haven’t experienced good results, it’s time to try a vibration machine. A lot of users have sung the praises of these machines in terms of reducing cellulite in different areas of the body. Helps with weight loss – If you’re on a weight-loss program this unit can help supplement your dieting efforts. You can get a full body workout in just 10 minutes and see the pound melting off. Promotes muscle building and toning – This is a great machine to use if you want to build and tone your muscles but can’t follow a high impact workout. You can get better tone and more muscles by using this machine on a regular daily basis. Console is easy to operate – This machine comes with an LCD display on the console showing how much time you take per routine and the vibration speed. You’ll be able to monitor your progress easily with these controls by your side. Increases bone mineral density – Scientific research has proven that vibration machines can increase your bone mineral density. Osteoporosis occurs when your bones become thinner due to the aging process. Can handle 300 pounds maximum – This machine can handle a person weighing up to 300 pounds. Just about anybody will be able to use the Crazy Fit Vibration Platform to their advantage and see all the wonderful benefits from it. 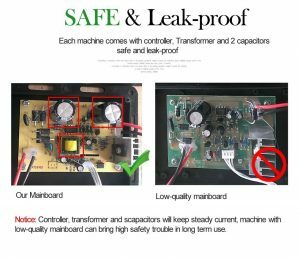 As with all vibration machines, it’s suggested that you purchase the extra warranty for added protection. These machines are vibrating at high speeds and you can purchase an extra warranty for 3 years at a ridiculously low price. This is the best vibration machine that we have found based on both its features and its price. When you want a full body workout without having to hit the gym, this is the best vibration platform on the market today. 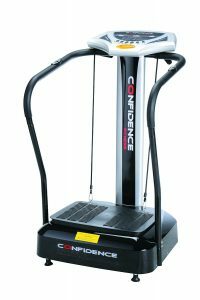 When you’re looking for value for the money, check out the features on the Confidence Fitness Slim Full Body Vibration Platform. This is also an exceptional machine that provides vibrations at high frequencies to create stretch reflexes in the body. You’ll feel your muscles contracting almost effortlessly as the vibrations do their job. In fact, only spend 10 minutes on this vibration plate equals an hour of traditional exercise. If you’re trying to lose weight, use the machine 2 to 3 times per week along with your diet plan to see fantastic results. 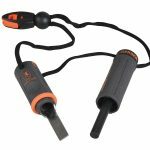 Increases muscle strength – This is a great machine for anybody looking for a low to no impact workout tool. This machine is easy on the spine, joints and organs and provides a very low body impact. 4 training modes – Choose between manual, program 1, program 2 and program 3 with each one lasting a full 10 minutes. The automatic programming adjusts the speed of vibration every 30 seconds so you won’t have to constantly change your position. Comes with yoga straps – Yoga straps allow you to work out your upper body easily since you’ll be able to keep it in the right position. It’s much more difficult to work out the upper body successfully when you don’t have these straps to hold onto. Improves circulation – You’ll feel the blood rushing to your body when you use this machine. It improves the oxygen levels throughout your entire system and you’ll feel a rush of energy following the workout. Improves general fitness – If you don’t have a lot of time on your hands you can set up this machine and do the workout while you’re watching your favorite TV show. Now there’s absolutely no reason to avoid working out any longer. Quiet operation – You’ll find that this unit is a lot quieter than many others so you’ll be able to watch TV or listen to music easily during your workout. Compact yet powerful – if you don’t have a lot of space in your home this would be the perfect vibration machine for you. You can store it in a corner and then pull it out to use later. It has wheels underneath so you can roll it out whenever you feel the need for a workout. The only negative that should be noted on this machine is the need to tighten the screws once in a while since they can loosen due to the vibration. Other than that, this is a great piece of equipment that provides excellent value for the money. 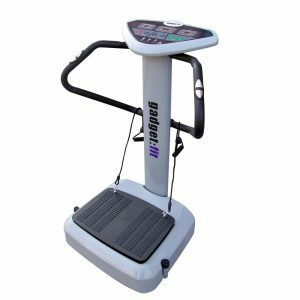 Lose weight, strengthen and tone your muscles, say goodbye to your cellulite and improve your overall physical fitness with this Confidence Fitness Slim Full Body Vibration Platform. You’ll never have to lift weights or run endlessly on a treadmill again. If you’re working on a budget but you’re in the market for a vibration machine, take a look at the outstanding features that the Gadget Fit Power Vibration Plate offers at a bargain price. Improve your balance, get better flexibility, reduce your cellulose while increasing your muscle mass on this easy-to-operate vibration machine. It’s an affordable model that offers a lot of the features that you’d find on higher-priced units. 50 speed settings – This vibration trainer has 50 different speed settings along with 3 pre-programmed workouts. No matter what your fitness level may be, you can get started right away on this machine. Display shows speed/pulse/time – The digital display shows your pulse, the time and the various speed settings. One thing that we like best about this model are the clearly labeled buttons on the menu. This is really an easy vibration platform to use – even for the technically challenged. Comes with hand straps and handlebars – You can use the handlebars as a gripping feature while you’re standing on the platform. The hand straps are clipped onto the vibration plates allowing you to work out your arm muscles during a session. 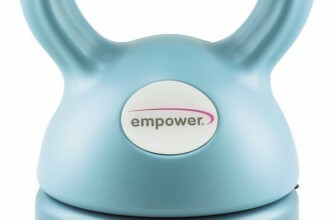 Workouts for people on the go – Reduce your workout sessions to just 10 minutes at a time with this vibration plate. A 10 minute session will replace an hour of traditional workouts. If you’re a busy person and don’t have a lot of time to devote to exercise, this may be the perfect solution for you. As well, after a hard day at work, you’ll feel your fatigue and stress lifting away once you step on the machine. Priced right – This is the perfect machine for people that are both health and budget conscious. When you want to invest in a vibration platform but your funds are limited, this is the best one that we could find in a lower price range. This unit really is a space saver so you won’t have a hard time finding a place for it in your room. You will, however, need to find a permanent home for it since it weighs quite a bit, making it difficult to move around. This is a perfect unit for small homes and apartments that don’t have a lot of space to accommodate a home gym. This unit runs quietly, is a breeze to assemble, doesn’t take up a lot of floor space and it can accommodate individuals that weigh up to 265 pounds. Your workout sessions can be fun again with the Gadget Fit Power Vibration Plate, which takes all the strain and labor out of exercising. You’ll feel the energy returning to your body as it forces your muscles to contract and then relax again. When you’re on a budget and want to experience all the benefits of vibration workouts, the Gadget Fit unit fits the bill. When you want to feel better than ever both physically and mentally, step on a vibration machine and get your workouts started. These units can provide wonderful physical benefits but we can’t overlook the amazing mental benefits that also go along with this exercise technique. When you come home from work after a long day at the office, use a vibration machine to reduce your level of stress in just a few short minutes. When you just stand and relax on the machine you can feel the stress and tension leaving your body. Vibration training positively affects the production of neurotransmitters and hormones in the body. Many users have commented that they felt revitalized and that their spirits lifted following a workout. When we used the vibration platforms we were surprised to see that we had more energy after the workout than we did before stepping onto the plate. This was a huge bonus that we didn’t expect. Not only did we experience weight loss from the direct use of the machine but we found ourselves burning more calories afterwards due to our increased energy. It’s important to note that weight loss has become a serious issue in this country. We’d like to acknowledge the fact that exercise for many people is unconfrontable and seems like sheer torture. With a vibration machine, things are completely different. A person just needs to stand on it to experience results and the exercise can be done in the comfort of your own home for only 10 minutes at a time. It is a solution to today’s modern obesity problems and is often used as a stepping stone to more vigorous activity. Once you start losing weight and getting more energy, you’ll be more likely to consider adding more exercise to your weekly schedule. If you’ve been trying to lose weight but haven’t been seeing the results that you’ve expected, it’s time to give a vibration machine a try. For many, this form of exercise has been the answer to their weight loss struggles and has given them a brand-new lease on life. No matter what your reasons may be for having interest in this type of low impact exercise, you’re on the right track. Vibration machines are becoming more and more popular as an addition to in-home gyms. If you don’t have this piece of equipment in your home yet, you’re missing out on the countless benefits that they provide. While these machines have been in use for many years, they have been recently rediscovered and nowadays we can use scientific proof to show why they work. It’s a new day and age in fitness training and the time has come to give the vibration machine all the credit it deserves.